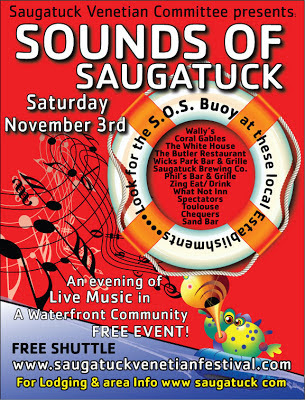 The Sounds of Saugatuck features more than a dozen bars and restaurants offering a variety of music on Saturday evening, November 3rd 2012. The event showcases the very active off-season bar and restaurant scene here in the Saugatuck-Douglas area. Music lovers can listen to Reggae at one spot to Jazz at another, by riding a free shuttle service. This year has a new twist for the shuttle service. We have Cindy's Moonlight Express as the official SOS shuttle. It allows for greater flexibility during the event. 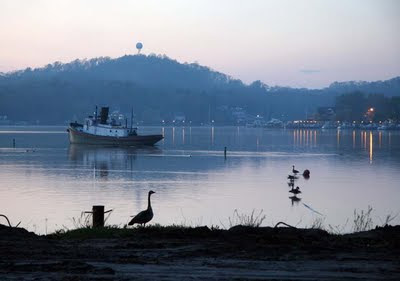 Participants can travel FREE from one venue to another, plus it would allow the shuttle service to pickup and drop off at their residence for normal taxi rates. This takes the worry out about parking, transportation or weather. A kind of one stop shopping. Have fun and be responsible out there.